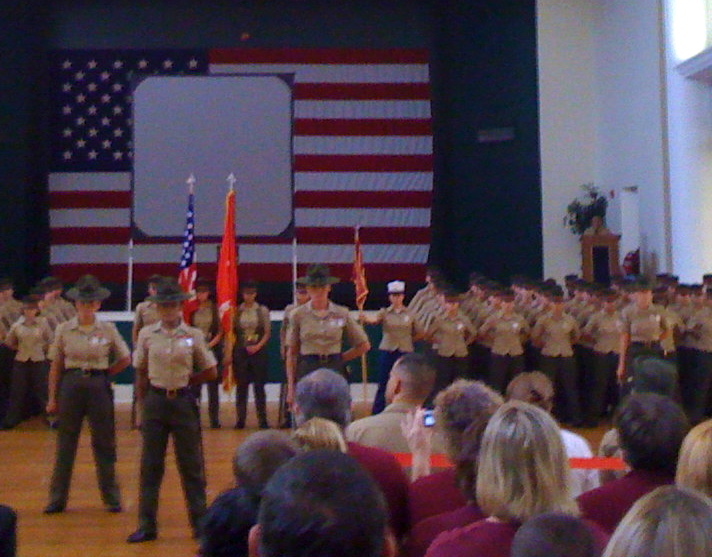 It was four years ago today that I had the privilege of attending my daughter’s Marine Graduation. For here an accomplishment of no small feat. It was a proud moment for her and her family. Only days before our arrival at Parris Island, South Carolina Lisa was required, along with the rest of her Platoon to complete the Crucible. A 54 hour, 40 mile test of endurance, skills and team work. Recruits are allowed very limited sleep and 2 1/2 meals over the 3 days. Marine Graduation takes place, only after successful completion. It was a wild trip! What had been Hurricane Faye was downgraded to a tropical storm as we arrived. No problem right? Wrong! As we left the Orlando Airport and headed east towards the coast it began raining. The mini van we rented was pushed about with each gust of wind. Gusts which rolled over us like the small waves of water flown across the road. With my son as copilot, I had him use my iPhone to view the current weather maps. As it turns out were were in the worst part of the storm. That was good, we might have been in trouble otherwise. Escaping the clutches of the storm, we eventually arrived in SC very late that night. That crazy non-hurricane crossed back over Florida just in time to give us another blast on the way back two days later. Out here on the west coast we watch the news with curiosity when hurricanes develop. I have a new found respect. While Fay was “only” a tropical storm, we saw a semi-truck laying on it’s side along the highway and multiple billboards that were laying on the ground, their large steel posts snapped in two. As we arrived at our hotel in Orlando, which missed the direct path of the storm, I starred at a swim pool filled with chairs, loungers, palm tree fronds. Back to Marine Graduation. The Marines are unique with their Boot Camp. Marine Boot Camp consists of 12 weeks of training and no direct contact with family. Old fashioned snail-mail is all that is available, assuming the recruit can find time during the 60 minutes they have each evening to prepare their equipment for the next day. In any case, we left home having no guarantee that she would be graduating. Not all do. The next morning we caught up with Lisa who had been sick the previous night with a 103 degree temperature. After breakfast and a short visit she returned to her platoon. We returned to our room. The next morning was graduation. The Marine band was amazing. The ceremony was precise. The emotion and pride on behalf of everyone in the room overwhelming. Cpl. Lisa Werth recently finished her active duty. It has been great to have her home for a couple of months before she heads back to California to start the next phase of her Life Journey; College. When your child serves, there is pride, sadness and at times, a sense of helplessness. At one point along the way I tried to capture the feeling felt on both sides. Here is the video.